Letitia "Tish" Long has spent more than two decades working in the intelligence community. Fort Belvoir, Virginia (CNN) -- A chunk of the glass ceiling came tumbling down Monday as veteran national security officer Letitia "Tish" Long became the first woman to head a major intelligence agency. Long, who has spent 32 years in government service, including more than two decades in the intelligence community, was sworn in as director of the National Geospatial-Intelligence Agency, the office responsible for collecting and analyzing overhead imagery and geospatial information. The swearing-in took place at NGA's sprawling $1.7 billion, 2.4 million square foot complex in Fort Belvoir -- soon to the agency's new headquarters. Sen. Dianne Feinstein, chairwoman of the Intelligence Committee, said the installation of a woman to run a spy agency with a multibillion-dollar budget and thousands of employees is a key milestone. "This is an important appointment, and I hope that she will bring a new and determined management ability to this agency," Feinstein said. Defense Secretary Robert Gates noted that the NGA has played a critical response role in several recent high-profile domestic and international events. Among other things, it assisted relief efforts after the Haiti earthquake and tracked oil after the Gulf spill. "It's impact has been real and profound," he said. It's a "critical link" in the intelligence community. Women have served as second-in-command in most of the major intelligence agencies. Long spent the last four years as the deputy director of the Defense Intelligence Agency. Women have also held the No. 2 two position at the National Security Agency, the National Reconnaissance Office and at NGA. The CIA has never had a women in the No. 2 slot. However, the person currently in the third-ranking position at the agency is a woman, as is the person in charge of all of the CIA's analysts. Long said the intelligence committee has benefited from including women and minorities. "The intelligence and defense communities have gained an incredible range of talents, skills, knowledge, and insight by welcoming not only women, but also more minorities, to the field," she said in written answer to questions from CNN. "I believe that when you have a more diverse population exploring any type of intelligence problem, you will develop a broader and deeper range of solutions. I like to refer to that wider scope as 'cognitive diversity.'" Long began her career in 1978 as a civilian engineer in training for the Navy, working mostly on submarine acoustic sensor programs. After a decade as an engineer, she joined the staff of Naval Intelligence. As she climbed the career ladder, Long served a tour of duty at the CIA before holding a succession of No. 2 positions: as the deputy to the director of naval intelligence, followed by the Undersecretary of Defense for Intelligence and finally, at the Defense Intelligence Agency. CIA Director Leon Panetta said Long's vast experience makes her an "outstanding choice" to lead National Geospatial-Intelligence Agency. "Having served in so many important roles over the course of her distinguished career, she will undoubtedly exercise strong leadership at NGA and help identify new ways to meet those challenges," said Panetta. Long's former boss had nothing but praise for her. Former Undersecretary of Defense Stephen Cambone said Long has unparalleled people skills. "I talk about her as being the velvet hammer. She could cause people to do things that they otherwise would not have thought they wanted to do and in the end, get them to do it willingly," said Cambone. He added Long has the instincts, patience and decisiveness to be an effective leader. 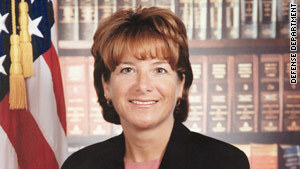 John McLaughlin, the former CIA deputy director, who worked with Long while she was at the agency said Long was ideally suited for the job, because, "not only does she have a deep understanding of defense intelligence needs but assignments over the course of her career have given her a unique window into civilian intelligence as well." He added: "A woman at the helm of one of our major intelligence agencies is a long overdue step recognizing that the contribution of women to intelligence success has long been equal to that of men." According to the most recent figures available from the office of the Director of National Intelligence, women represented 39 percent of the workforce at the six major intelligence agencies during fiscal year 2009. Women held 27 percent of the senior positions within those six offices. And 46 percent of all promotions in those agencies went to women. The government statistics indicate the percentage of women serving in the intelligence community has not changed much over the past ten years, but the percentage of women being promoted has increased each year. Long said the career is rewarding no matter the gender. "The ability to contribute to our nation's safety and security is a superb lifelong calling," Long said. "Above all, understand the serious nature of our mission and stay focused on doing your best to support that mission. I've found that when you do that, whether you are a man or a woman, you will have a rich and rewarding career of accomplishment and service to the nation."